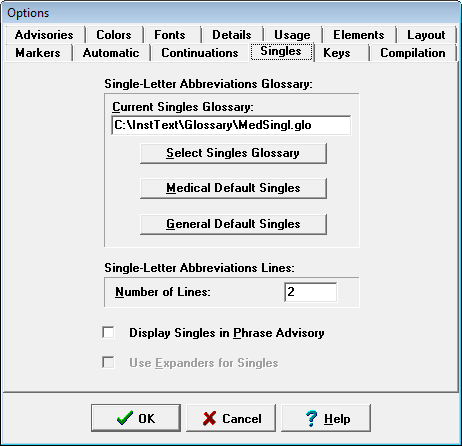 The Singles menu item of the Options Menu opens the Options Singles page that lets you specify the glossary to use for expansion of single-letter abbreviations. This contains the most frequent medical words. This contains the most frequent English words. You can also start with one of these default glossaries and modify it to reflect the words (or even phrases) that you use most frequently. Other glossaries for singles of other languages can also be selected, for example, Single_Fr.glo for French, and Single_De.glo for German. You can specify the number of lines of single-letter abbreviations displayed in the Word advisory. To turn off single-letter abbreviations, use the value 0. If this option is checked, single-letter abbreviations are displayed in the Phrase advisory. If this option is checked, phrase expander keys also apply for single-letter abbreviations.